The wonderfully-named Quaggy River runs through part of South-East London, including the boroughs of Bromley, Greenwich and Lewisham. The river regularly flooded, due to development on the flood plain, and the Environment Agency had carried out a huge amount of restoration work. The aim was to alleviate flooding and restore the river as an amenity for local people. 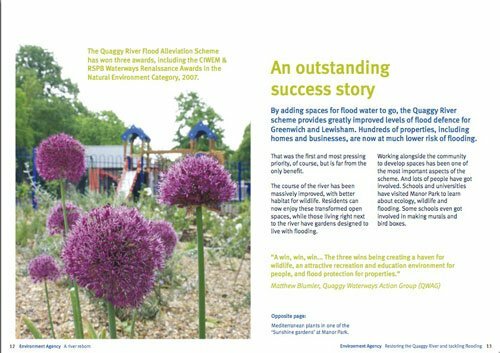 The Environment Agency wanted to promote this work as an example of best practice. What had been derelict wasteland where few would venture for fear of crime has been turned into wildlife areas and parks as well attractive river settings used widely by the local community. The leaflet had to be short and easy to read but still informative. It also had a serious job to do – to help convince the public, central government, local authorities and other organisations of the many tangible benefits that come from such schemes. The key to creating a leaflet that would communicate effectively with such a wide audience was to write with clarity, keeping the tone light, while still delivering carefully structured, logically ordered information.